Learn the skills and models you need to make better, more impactful decisions. 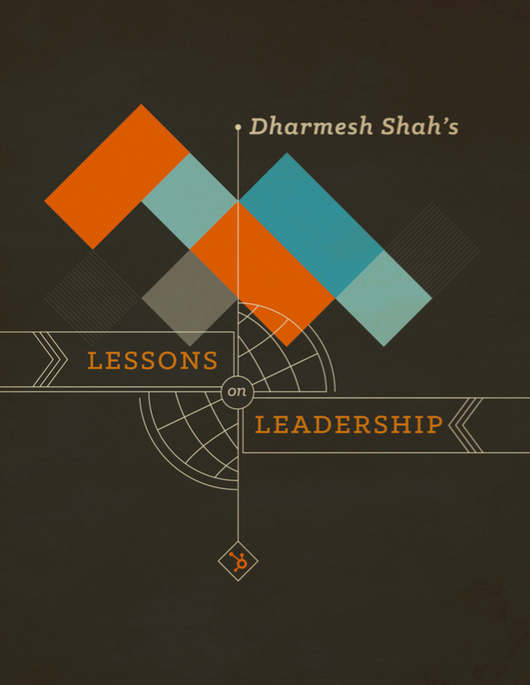 Lessons on leadership from Dharmesh Shah. Fruit loops or cheerios? Call or email? John Wayne or Clint Eastwood? To be, or not to be? If you’re like most reasonably decisive adults, you make 35,000 conscious decisions every day. That’s a heck of a lot, but most of them are straightforward or trivial. It’s the major ones — or even a series of smaller decisions — that need some strategic thinking. The thing is,98% of organizations aren’t very good at decision-making. Sometimes it’s a case of time pressure and relying only on impulse or off-base instinct. Other times, we don’t do all the prep work needed to make a smart decision, like identifying all our options and gathering enough evidence. Too much information can be just as bad. Whatever the case, Daniel Kahneman, who studies judgment and decision-making, says we think we’re more rational than we actually are — especially when we let cognitive biases derail our thoughts. But we know you won’t make those mistakes anymore. Because you’re about to learn the time-tested decision-making techniques that will get results. Decision making is the process of identifying the logical choice among several available alternatives. To make a good decision, you should be able to predict and evaluate possible outcomes, weigh the positives and negatives of each, and come to a final conclusion. Experts think decisions result from two types of cognitive processes: intuitive and rational. Now for what decision-making is not: a talent. It’s a skill you can practice and improve. As we mentioned earlier, decisions are best served part reason and part intuition. You won’t implement your decision effectively if it doesn’t feel right (we’ll leave that part up to you), but it’s important to weigh the facts. That's where practical strategies can help. Your decision won't feel so complex if broken into manageable components, but a pros and cons list doesn’t always cut it. Here, we’ll go over three somewhat more complicated yet effective tools: the decision matrix, decision tree, and mental model. When you’re overwhelmed with options and variables, or you see no obvious choice out of several perfectly good ones, the decision matrix (also known as the decision-making grid or Pugh Method) works wonders. Let’s say your company needs a CRM. You’ve shortlisted a few industry-leading solutions. 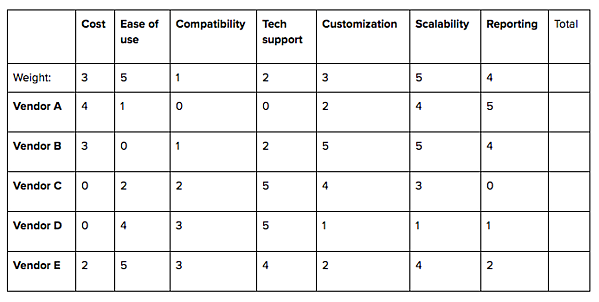 Using the decision matrix, you can draw a complete, objective comparison of vendors based on the criteria most important to you, all in one neat little table. List your decision options. In this case, your vendors. Arrange them in rows. List the factors affecting your decision. What are some key considerations when choosing software? Make these your columns. Add an extra row for weight, and an extra column for total. Score each option for each factor. 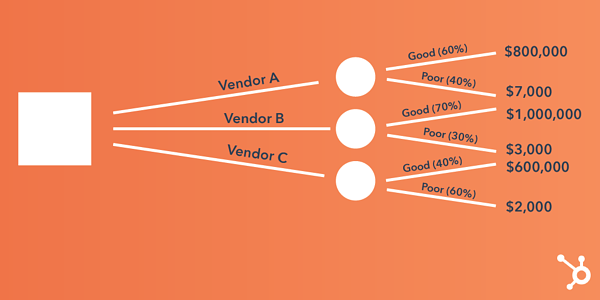 How well does Vendor B satisfy ease of use, for example? Work your way down each column, scoring the vendors from 0 (poor) to 5 (rockstar). Be as objective as you can. Calculate your weighted scores. Multiply the scores from step 4 by the values in step 5 where they intersect. These are your weighted scores for each option/factor combination. Make them your new cell entries. Add up the weighted scores for each option. Pick the highest. A decision tree is 1) a sort of pattern used in machine learning and data mining to map out algorithms, and 2) a flowchart any organization can use to map out the costs, benefits, and probabilities of every possible outcome at multiple stages of every decision within a decision. Don’t worry. It isn’t as complicated as it sounds. We’ll use our CRM software example to illustrate. The tree starts with a single square, the decision node, representing the decision to be made (source the world’s best CRM). The decision node branches off into possible actions or solutions (your CRM vendors). The next nodes depend on results. 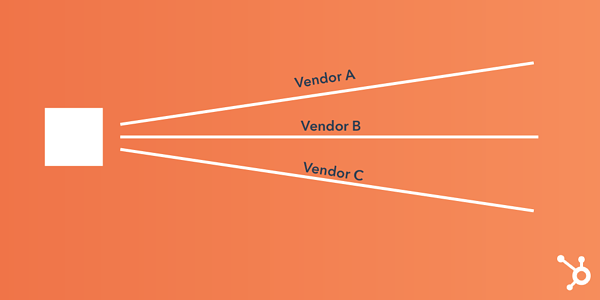 If the outcome of choosing a vendor is uncertain, its branch ends with a circle, the chance node. 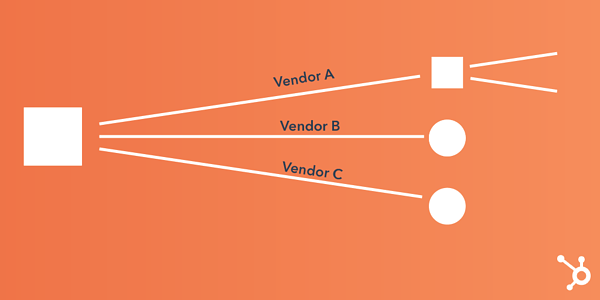 If the vendor brings up another decision, its branch ends with a square and starts over. On each branch, add the probability of each outcome as a percentage. At the end of the branch, add a cash value or score based on how much the outcome is worth. Use your best guess if you don’t have hard data. Continue to expand your tree until every line reaches an end node (a triangle), meaning you’ve considered every possible outcome and decision that could come from the original decision. Calculate the value of uncertain outcomes (circles) by multiplying their cash value by their good/poor probability. Jot down the total for each vendor. For Vendor A, that would be ($800,000 x 0.6) + ($7,000 x 0.4) = $482,800. Calculate the value of decisions (squares), first by noting the cost of each option. Subtract that cost from the value of the uncertain outcome. The result represents the benefit of the decision. Say Vendor A cost $100,000, its benefit would be $382,800. 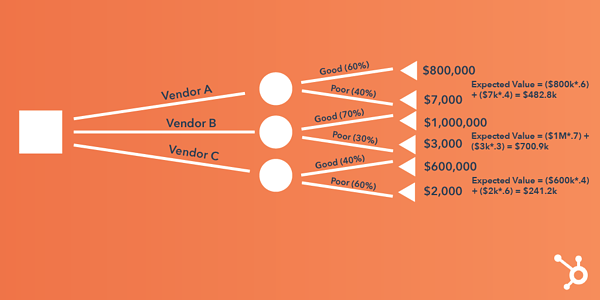 Go for the vendor with the biggest benefit, i.e., the largest number. Take advantage of free trials from dedicated decision tree makers like Lucidchart, SmartDraw, or Zingtree before buying a plan. On a smaller budget, you can make basic flowcharts in Word. A mental model is a framework or theory about how the world works. We use mental models to guide our everyday perception and behavior, but also as tools to see problems more rationally so we can take appropriate action. The key, since you can’t explain every problem with one worldview, is to learn (and use a combination of) as many mental models as possible. Confirmation bias: the human tendency to interpret signs in ways that confirm what we already believe. Inversion mental model: considering outcomes you want to avoid rather than pursue. Opportunity costs: recognizing that every choice comes at the cost of another. The Farnam Street Latticework of Mental Models details more than 100 of these frameworks, but according to James Clear, you need only master a few dozen to become a world-class thinker. This guide explores 14 of the most common. The secret to efficient decision making? A structured, step-by-step approach. Various psychologists recommend anywhere between five and seven steps (think back to high school processes like GOFER and DECIDE) to an informed conclusion. Since this is the ultimate guide, you get an eight-step mishmash of them all. Identify a problem, opportunity, or goal. Recognize it exists and whether it’s worth addressing. Then make the conscious decision to do so. Gather information. What do you need to know to make the right decision? Seek out the data and people who can help. Consider your options. As many as you can think of. The more, the better your chances of finding one that ticks all your boxes. Brainstorm possible outcomes. Create a pros and cons list, cost-benefit analysis, or one of the models above to understand the risks involved. Make your choice. You’ll probably want the option with the highest chances of success. Take action. Allocate the resources and onboard the stakeholders needed to make the magic happen. Assess the impact. An overlooked but super important step: building a feedback loop into your decision-making process. What went well? What would work better next time? Beware of cognitive biases. Like mental models, they’re established frameworks for how our mind works and can be effective. But they can also cloud our judgment. Discovered something new that suddenly crops up everywhere? That’s the Baader-Meinhof Phenomenon, and it can trick you into disregarding potential options. You can’t make every decision as an individual, of course. At some point, you’re going to need buy-in for an idea, or ideas from others. Open discussions make great discussions, but in the wrong setting, they’re floodgates to conflicting opinions or inefficient brainstorming. The above process works well in teams, but can only go so far without using group (AKA collaborative) decision-making techniques as a basis. Consensus: Negotiating the decision until all group members understand and support it to some degree (not necessarily unanimously). Voting: Making a decision by majority, by negative minority, or by ranking. Decision by authority: Consulting the group for ideas and advice but making the final decision as an individual. However, there’s no correct method for each team. Different situations call for different levels of participation. Before the meeting, you have your own decisions to make. Which method will leave your team feeling best about the solution? Have you invited only the people who need to be involved? Here comes another decision tree: the Vroom-Yetton Decision Model. Based on seven qualifying questions (which, incidentally, can help determine whether you need to involve a group at all), the model will guide you to the most efficient decision-making style for your situation. By now you know that wise decisions rely on a lot more than instinct. But it’s not enough to memorize a bunch of techniques either. Hopefully, this guide has left you with a sense of what tool to apply to what problem. Overconfidence is not your friend. Don't be afraid to use competitors’ experiences as benchmarks. And if your decision turns out to be the wrong one, you probably need to generate more information or options. Keep calm, use that feedback loop, and think of your decision more as a journey than a destination.